For the Spring 2016 Semester, the Curriculum Resource Center will once again become the Graduate Student Lounge (GSL) space. Starting Monday, January 11th for the first 11 weeks of the semester, the GSL will run Monday – Thursday, 4:30PM-7:30PM. The space features 2 hard-wired Mac computers, a digital projector and monitor, whiteboard and flexible group seating. The room will be staffed by trained graduate students who can provide basic information regarding resources on campus such as the ID process, course registration, parking, career services, PirateNet, IRB documents, and classroom locations. In addition, ‘guest’ presenters from various areas, such as financial aid and library services, may participate at key points in the semester when those services are most needed. And of course the Library is always staffed with Reference librarians, Circulation staff, technology help, and specialized information consultation services which can be scheduled. 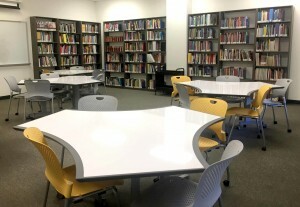 This space provides support for the range of needs and issues that graduate students face: quiet space, group study space, research support, IT support, presentation practice/equipment, and an opportunity to connect with other graduate students.